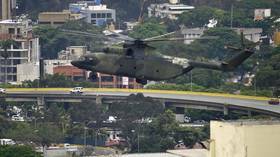 A new helicopter training center has been built in Venezuela, the Russian state arms exporter said, pledging to deepen cooperation with Caracas. The news comes amid US threats of sanctions over Russia’s presence in the country. The training center, built by Russia’s arms exporter, was unveiled on Friday, according to press service Rosoboronexport. The center is designed to train Venezuelan pilots to use such Russia-made hardware as Mi-17 and Mi-26 transport, Mi-35 attack helicopters and others. While military ties between Moscow and Caracas go a long way back, this statement might signal Russia’s unwavering intent to stand by Nicolas Maduro’s government, to which the Venezuelan Army has remained loyal despite the massive US-backed protests gripping the country. The new training facility was opened at a time when Washington is openly supporting a coup led by the opposition leader, Juan Guaido, who has proclaimed himself as interim president, while branding the legitimately elected president a usurper. Officials in Donald Trump’s administration saw red when planes carrying Russian military specialists landed in Caracas on Saturday. Moscow later confirmed that the arrival was linked to the military-technical cooperation deal sealed in 2001, stressing it does not need any further approval, including by the opposition-controlled parliament. Since then, President Trump himself has demanded that Russia “get out” of Venezuela, his National Security Advisor John Bolton said that they “won’t tolerate” a different foreign power meddling in the Western Hemisphere, while the US special representative for Venezuela, Elliott Abrams, has outright threatened sanctions on Russia for the move. Speaking outside the White House on Friday, Trump told reporters that he might discuss the Venezuela crisis with Russian President Vladimir Putin. "We will probably be talking at some point," he said.